Next, Creamer adds elements that play with the chipboard's structure, a degraded material that he elevates through his artistic process. Depending on his response to the particular piece of wood, he might insert a polygon — often rectangular or trian- gular — into its surface. "I will play with different inserts," Creamer shared. "As a last resort, I will pull the color out and use wood putty, which mimics the substrate. Typically, I striate or scar a surface to give it texture for the paint to adhere to. Sometimes when I'm doing that, I see that it looks better. Rather than covering it over with paint, I leave it exposed. And some areas are excavated space." "There's a lot of improvisation," he said. "There is no game plan." Even though he begins each work with intention and creates parameters for it, he finds that intuition takes over. "I let them talk to me," he said of his works in progress. "I can't force it." In the studio, Creamer's works hang in rough order of their creation. 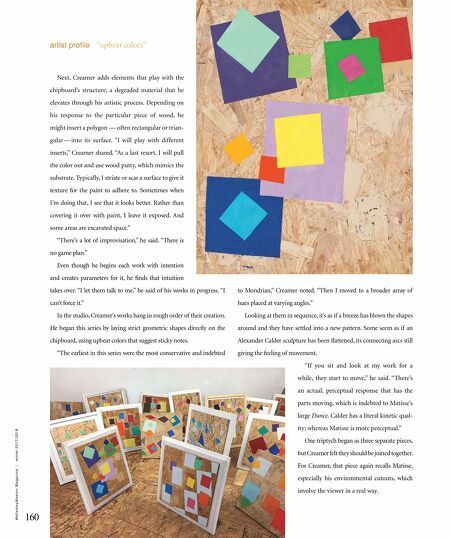 He began this series by laying strict geometric shapes directly on the chipboard, using upbeat colors that suggest sticky notes. "The earliest in this series were the most conservative and indebted to Mondrian," Creamer noted. "Then I moved to a broader array of hues placed at varying angles." Looking at them in sequence, it's as if a breeze has blown the shapes around and they have settled into a new pattern. Some seem as if an Alexander Calder sculpture has been flattened, its connecting arcs still giving the feeling of movement. "If you sit and look at my work for a while, they start to move," he said. "There's an actual, perceptual response that has the parts moving, which is indebted to Matisse's large Dance. Calder has a literal kinetic qual- ity; whereas Matisse is more perceptual." One triptych began as three separate pieces, but Creamer felt they should be joined to gether. For Creamer, that piece again recalls Matisse, especially his environmental cutouts, which involve the viewer in a real way. 160 W e l l e s l e y W e s t o n M a g a z i n e | w i n t e r 2 0 1 7 / 2 0 1 8 artist profile "upbeat colors"